lovers die; long live love letters! I’ve often read or heard other bloggers complain of not knowing what to post about: “What can I put in this week’s blog post?” Heck, I have said the same myself. But in reality I think my problem is the reverse: I have too much to say, and don’t know what to choose or where to begin. But I have a blog and I do want to use it. I’d love to post every week and have many times “committed” to myself to do so. Ha. I’m afraid that my blog, like everything and everyone else in my life, will have to take what it can get. Know, dear reader, that I want to be doing more! One thing I can always talk about is my reading. I read every day, and I think about what I read. There’s no need to wait till I write a book review to share some of that. And I review only a small minority of the books I read, in any case. I generally have a novel or other poetic work on the go as part of my daily reading. 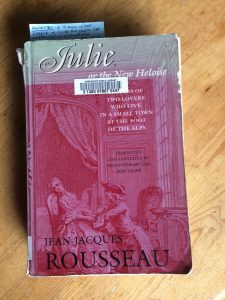 Currently I’m reading Julie, or the New Heloise, by Jean-Jacques Rousseau, first published in 1761. It’s an epistolary novel, taking the form of an exchange of letters between two young lovers in Switzerland, and careful study of references in the text has revealed that the fictional exchange takes place in 1734. Surprisingly, to me, considering its subject, the book is massive: the Dartmouth College edition that I’ve borrowed from the Vancouver Public Library runs to 728 long pages. A bunch of these are introduction and notes, to be sure, but still, how could Rousseau have written such a long work on such a seemingly slight topic? This novel alone constitutes volume 6 of the 7 volumes of the Collected Writings of Rousseau. I would have to dip in and read it to find out. Reading about the Romantics in 2004 flagged the novel to my attention, but it did not make it high onto my reading list until recently, now that I am involved in editing the love-correspondence between my departed friends Harvey and Dorothy Burt, which my mother and I are shaping into a book, or a series of books, called The Hour of Separation. Part of the process of getting ready to propose this work to agents and publishers is to review other similar and related works, to see how ours will complement and compete with them in the literary marketplace. I decided that Julie, as the first “romance in letters,” needed to be on that list, even if it is not much read anymore (although the VPL has a copy, none of the other local libraries does). Thus did it make its way into my reading stack. So now I’m reading it. I’m 98 pages in, and I have to report that what started as a mere duty has become a pleasure. This surprises me a lot, because, in the first place, I’m not keen on epistolary novels. Pages and pages of people talking about their thoughts and feelings is a poor substitute for the vivid depiction of action. And it seems to me that the intimate personal quality of letters, their reality in reporting a real person’s thoughts, feelings, and state of mind at a particular moment, can’t really be captured in fiction. We remain subtly aware that these characters are not real people, that all the correspondence is really coming from a single hand; the quality of authenticity can’t be faked. Well, I’m finding that Rousseau is getting around this somehow. It turns out he’s a good enough writer to do it! Rousseau, to be sure, is a great writer: he is one of the authors whose works were selected for inclusion in the Britannica Great Books of the Western World series published in 1952 (Rousseau’s titles in the series: On the Origin of Inequality, On Political Economy, and The Social Contract, in volume 38). He gets things moving quickly with a young scholar who takes up a post as tutor to an 18-year-old girl, Julie, in a well-to-do household in Vevey, Switzerland, on the south shore of Lake Geneva. Before long the 20-year-old scholar, who remains nameless all through the early part of the correspondence, is in love with his pupil, and, he is stunned and ecstatic to learn, she is in love with him too. Problem: the difference in class between them precludes the possibility of marriage, or anyway a marriage that her parents could consent to. And so they remain locked in a furnace of emotional passion, unable to do much about it except write to each other. Which they do. While the lovers are different from each other, both are passionate, sensitive, and eloquent, and in the intoxication of love they explore the moral, spiritual, and aesthetic issues of their situation. But there is also a story: we look on as the lovers create schemes to get private time together, and then read about how things went awry along the way. Just as though these were real letters, we are not told exactly what happened, since the lovers were present at the events themselves, and we have to piece together the action by inferring things from what the lovers say. The author handles this skillfully, and apparently there are things that come clear only gradually over the course of the whole correspondence. I’ll admit it, I’m curious now about where it’s all going to go. The novel’s full title is Julie, or the New Heloise: Letters of Two Lovers Who Live in a Small Town at the Foot of the Alps. “Heloise” is an allusion to the 12th-century woman who had a passionate affair with the French philosopher Peter Abelard. He became her tutor when she was 17, and when her guardian and uncle found out that the pair had become lovers, he was so furious that he arranged for Abelard to be surprised in his bed at night and castrated. Abelard and Heloise both wound up entering religious orders, and embarked on a famous correspondence of their own (which I am also reading now). Heloise, intelligent and educated, became an abbess, but she did so only because her lover commanded her to; she loved only him and felt nothing for God. Anyway, their story was a subject of much interest in France in the 18th century, and Rousseau must have seen in it a hook on which to hang his developing ideas about Romanticism. And apparently it also closely parallels a time in Rousseau’s own life when he was such a tutor—in Switzerland—and fell in love with his pupil. It will be interesting to see how strong the parallel is between the real-life medieval lovers and Rousseau’s fictional Swiss pair. I find myself hoping, at the very least, that the young man manages to keep all of his organs contiguous with his body. So far (now to page 112) the lovers have skillfully managed to avoid detection. So there you have it: the fictional portion of my current reading stack. I’ve got a few other books on the go; maybe I’ll talk about them next. I’ve only scratched the surface about this one. There’s too much to write about, and that, friends, is why I write so little. This entry was posted in thoughts and tagged Goethe, Julie, letters, Liz Greene, love letters, Maurice Cranston, reading, Romanticism, Rousseau, the Great Books, The Hour of Separation. Bookmark the permalink.